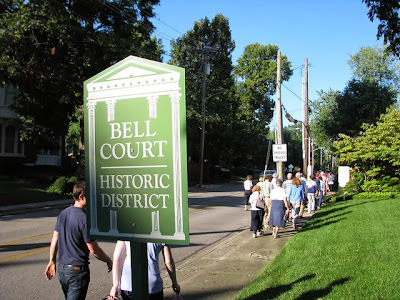 The BGT deTour of Bell Court - Lexington, Ky.
About one mile east of the courthouse is one of Lexington's small, closely knit neighborhoods: Bell Court. Upon even a cursory exploration of the neighborhood, one can understand a portion of its history. 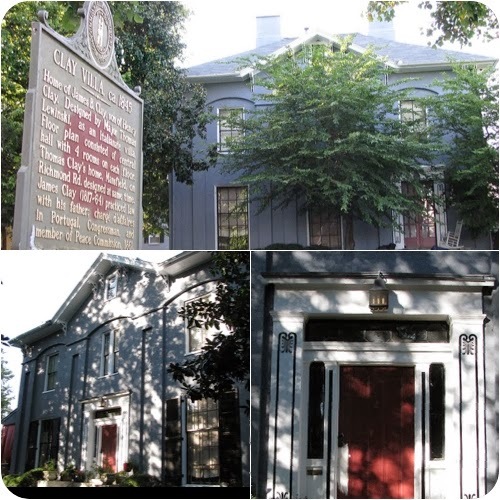 The presence of the impressive mansion at the heart of this little community bears witness to the pattern common in Lexington of "subdividing the parks and pleasure grounds of its great antebellum houses." Birchfield, 83. A collection of photos of properties in Bell Court as well as our guide, Jim Birchfield. The good news is that in the case of Bell Court, the original mansions were not razed. Note that the plural is used because two of the old mansions remain. Each is surrounded by examples of early twentieth-century architecture of the Queen Anne, Romanesque, Arts and Craft and Colonial Revival architectural styles. 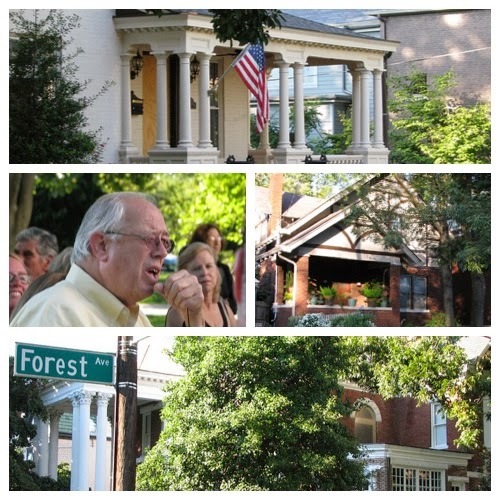 And like its variety of architectural styles, the neighborhood has drawn a variety of middle- and upper- class Lexingtonians from different walks of life to create a vibrant sense of community that has been enhanced by a strong neighbhood association (active since 1964). And while each house in Bell Court has its own beautiful story, constraints now limit their telling. What follows are the stories of Bell Place, Clay Villa, and the Episcopal Church of the Good Shepherd. The primary property in the neighborhood is Bell Place which was constructed on the foundation of Woodside. 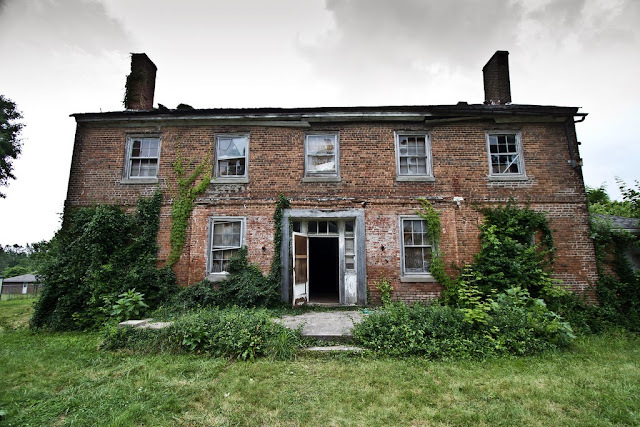 Woodside had been designed and built by local architect Thomas Lewinski for Henry Bell on thirty-five acres of land which Bell had acquired for $8,750 in 1845. 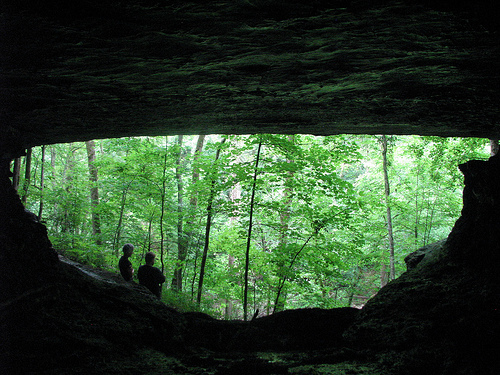 The land had originally been part of the 1,000 acres owned by Col. John Todd. Ma & myself rode out to Mr. Bell's splendid place this afternoon to return a call. The house and grounds are magnificent. Birchfield, 87. Upon his death in 1883, Henry Bell conveyed the thirty five acres and Residence to his only son, David Davis Bell (D.D. Bell). 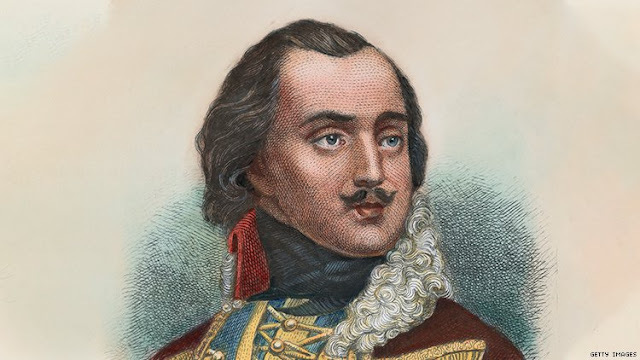 Lewinski had passed the year before and was thus unavailable to help D.D. Bell in rebuilding the family home after it burned in 1884. Photos of the Bell House - Lexington, Ky.
Bell retained Cincinnati architect Samuel Eugene Des Jardins whose 23-page specifications for construction contains frequent "superlative of adjective and adverb [but] nowhere any requirement for economies." Birchfield, 90-91. In other words, cost was not an issue. The wealthy Bell was an attorney and an astute observer of Lexington's growth. 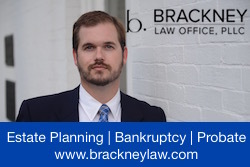 To these ends, he formulated a plan in the early 1890s to have a portion of his lands (retaining several acres around the residence) subdivided. D.D. Bell died, however, before this could be accomplished though a directive in his will prompted his widow to accomplish these aims with profits being placed in trust for their only child. 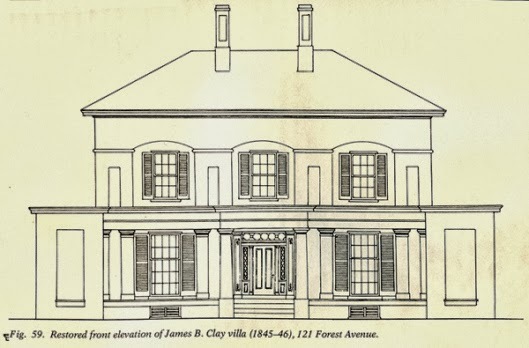 Clara's life and wealth were well-documented in a post on Bricks + Mortar. The earliest home in Bell Court was the contemporary to Woodside. 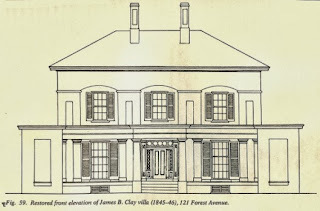 In fact, Thomas Lewinski's journals indicate that he worked on designing both Woodside and Clay Villa contemporaneously. 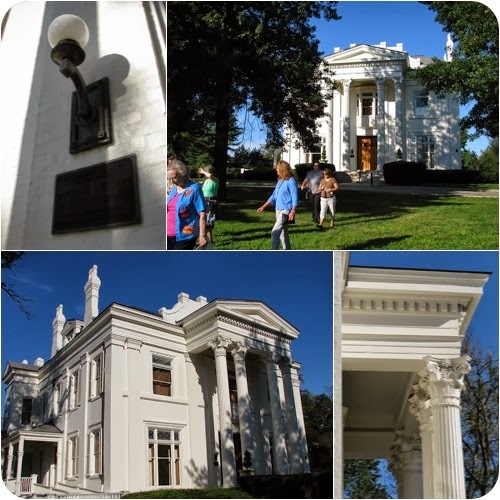 The Lewinski design was commissioned by Henry Clay for his son, James. (Interestingly, Clay also took the opportunity to commission Mansfield for son Thomas at also at the same time. Lewinski must have been quite busy in the 1840s!). 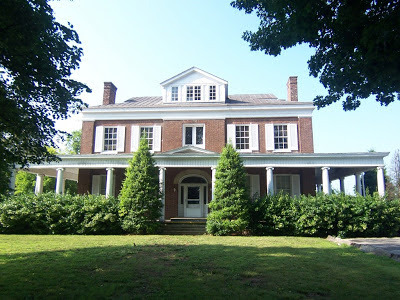 Italianate in style with Greek Revival details, [it is] a square symmetrical brick house with hipped roof and four long interior panel chimneys; its walls are divided into three sections by applied segmental arches between wide pilaster-like forms with narrow vertical panels. NRHP. configuration would have faced Main Street (lower left). It was James who would, after his father's death, raze and rebuild Ashland which had reputed to have fallen into disrepair. 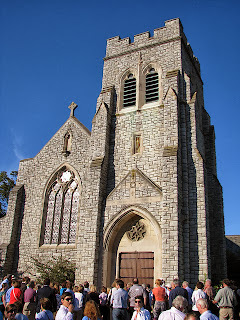 The fortunes of the church were given a great boost in 1924 when the Reverend Thomas L. Settles became the first and most effective clergyman to speak to the State Legislature against the anti-pari-mutual bill, thus gaining the support of followers of the turf. Wealth and prominent leaders of the horse industry, many not members of the church, began to support the ambitious building plans of Settle and the building committee, and the sanctuary was completed in 1926. There are 39 major stained glass windows in this beautiful Gothic Revival house of God. Additional photographs of the Bell Court neighborhood and its magnificent resources can be found on flickr. Again, special thanks to our tour guide of Bell Court: local historian and curator of rare books in Special Collections at the UK Library, Jim Birchfield.